It may seem a little premature to be writing about cold frames and frost on a beautiful late summer day, (sunny with daytime temps in the 70’s here in Vermont). 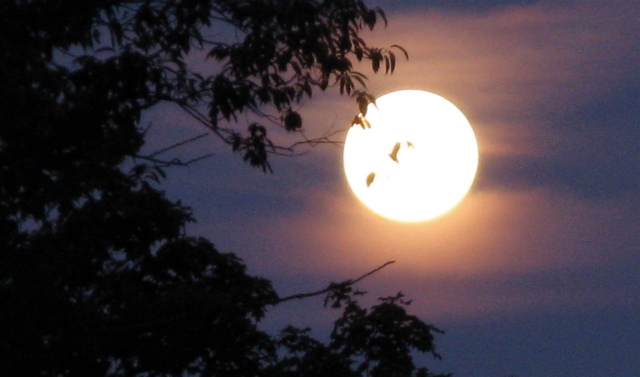 But the gorgeous Harvest Moon this past weekend served as a reminder that we are nearing the end of the growing season in the northeast. Nights are getting cooler now, warning us that fall is coming and frost will soon be on the way. Although I am excited about the coming autumn, I am definitely not ready to give up my homegrown produce. So I won’t – at least not until December. I don’t have a greenhouse yet, but there are plenty of late-season, cool-weather crops to plant now and enjoy later. In order to extend my growing season last year, I began using hoop-house style cold frames in my kitchen garden to protect a few beds from frost. Unheated cold frames can save many vegetables from killing frosts, including tender herbs such as basil and rosemary, and mature warm-weather crops such as cherry tomatoes and peppers. Later, my spinach, chard, and broccoli will be protected inside the hoop-houses from harder freezes in late November and early December. By using hoop-houses to protect my crops, I was able to extend my growing season by more than two months last year. Constructing a basic cold frame is a great two-person weekend project for early September. Cold frames are nothing more than unheated miniature greenhouses, and they are useful at both ends of the growing season. By protecting crops from frost with hoop-houses, cold-climate gardeners can still enjoy some vegetables into early December or longer. I now keep four hoop-houses installed in my potager throughout the winter. Although I am not able to make use of the garden in January and February, come spring the soil in these 4′ x 8′ beds will be warm and ready for planting weeks before the rest of the garden is clear of snow. Baby salad greens, spinach, broccoli and other cool-season crops can get a protected jump-start beneath the warm plastic of the mini-greenhouses. Hoop-houses are also a great way to protect and warm plants requiring extra heat, such as tomatoes, peppers and eggplant in the early part of the growing season. 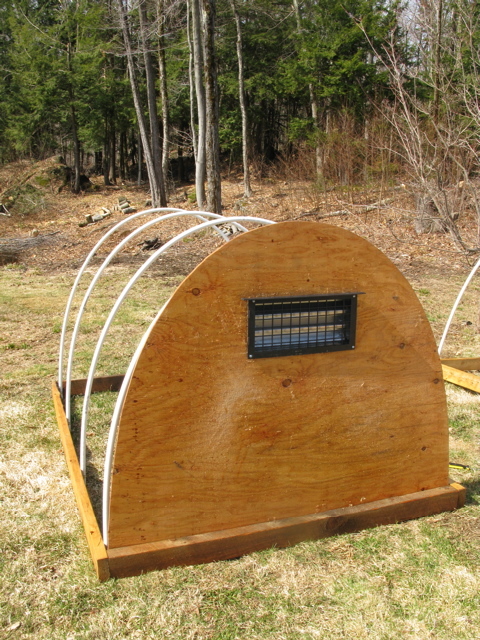 For someone with a few basic carpentry skills, a hoop-house is a simple project. If you can operate a skill saw and a screw gun, the assembly will be relatively easy. If not, maybe you can offer to share some produce with a handy friend or neighbor in exchange for a bit of help. Although the tasks involved in building a cold frame aren’t complex, this is definitely a two-person job. The simple design of the frame takes advantage of standard sized lumber, (8′ length), and only one cut is necessary to create the base. The ends of the wood are butted and screwed together with coated deck screws. Plastic tubing is cut to length with a hack saw and attached to the inside of the frame with pipe clamps. Then, ( to build an open-ended house), plastic is stretched over the tubes, folded beneath the rectangle frame and stapled to the inside edge of the wood. I keep the plastic ends on my un-sided hoop-houses folded closed with metal clamps. 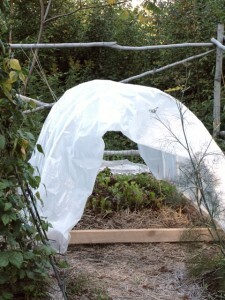 A plywood back and vent can be added on one side of the hoop-house for greater function and durability. I use both styles. 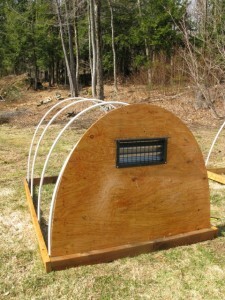 Cold frames are inexpensive to build, and when cared for properly, they can be used for years. With longevity in mind, it makes sense to seal the wood parts with oil to protect them from moisture. Maintenance is simple; occasionally, if you use your hoop-house throughout the winter in a snowy climate, the plastic may tear and need to be replaced. 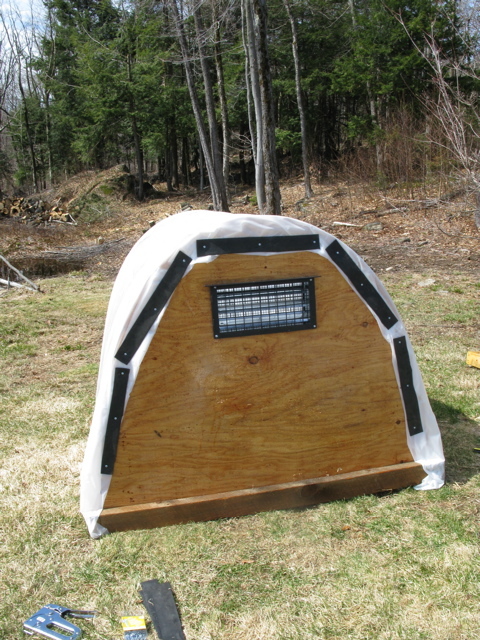 The cost of materials to create two simple cold frames in 2008 was about $74.50, (adding plywood and a vent to the back added an additional $25 per unit for a total of $62.25 each). 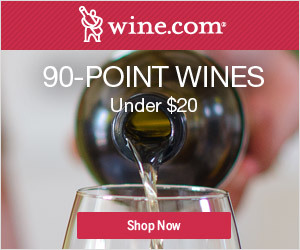 Your costs may be higher or lower, depending upon where you live, where you shop, and what kind of bargain-hunter you are. If you have some experience building things, and would like to make a cold frame of your own, review the materials list below and read the instructions carefully before you get started. The series of photos here were taken at various points during the construction of two hoop-house sets; one set was made with a vented ply-wood end, and one set was constructed without. 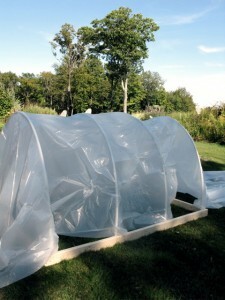 I would recommend starting with the basic hoop house first. If you feel comfortable with the building process you can always add a plywood back later. The photos below can be enlarged by clicking for a closer view of the frame. Keep in mind that these structures are very simply designed. They are only intended to protect your crops from frost and they do not need to be perfect. Go slow and, as they say, measure twice and cut once. To construct one cold frame you will need three 2” x 4” x 8′ spruce or pine boards. Cut one board in half to create two 4′ length pieces. Set the short boards inside the two long boards to form a box, as shown in the photos above. Screw the pieces together well, using at least two, (3″ coated), screws at each join. This rectangle forms the base of your hoop house. Sealing the wood base with linseed, (or other), sealer is a good idea to preserve the wood. If you do this, you will need to wait about 24 hours dry-time before continuing with the next steps of the project. If you are planning on adding a vented plywood back, this would also be a good time to seal the plywood with oil or stain. Next, measure and cut your PVC tubing with a hack saw, to approximately 6′ length pieces. Space the tubes evenly on the inside of the frame and affix to the frame with pipe clamps screwed, (1/2″ screws), into the wood. I prefer to measure and mark before attaching for even spacing, setting all the clamps in place first with one screw on each side. When assembling the hoops, it is easiest to affix all pipes to one side of the frame first and then affix the opposite side. * Note: If you are adding a plywood-vent end, draw a semi-circle outline on your plywood slightly larger than the shape of the hoops, (you can measure out the 4′ bottom edge end and then use one of the cut hoops as an outline for your circle). Cut the plywood semi-circle with a jig saw. Trace the interior shape of your vent in the upper middle of the plywood, and cut with a jig-saw. You may want to err on the tight side and test your vent fit in the opening. You can always make additional cuts with your jig-saw to fit the vent as you go. Finally, install your vent according to manufacturer instructions. 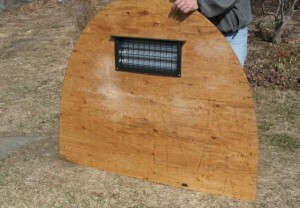 Once set, slip the plywood wall inside one end of the hoop house frame, and then screw the plywood in place to the base,(using 2″ coated screws), as shown in the photo above. Clamp the plywood to the end hoops, (at least three points), and screw in place with 1/2″ screws. You are ready for the next steps below. Once the hoops are evenly in place, lay out the plastic. 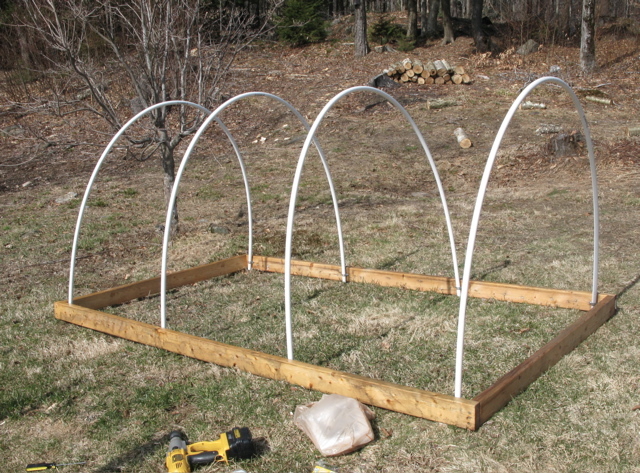 Do a dry-run and stretch the plastic over the hoop house, checking to be sure that your length of plastic will fit evenly around the hoops with a few inches remaining to fold under the frame and staple. You also want to be sure the plastic is long enough on the open-ends to fold shut on both sides, (and to staple/fold and close the ends of a vented-style house). 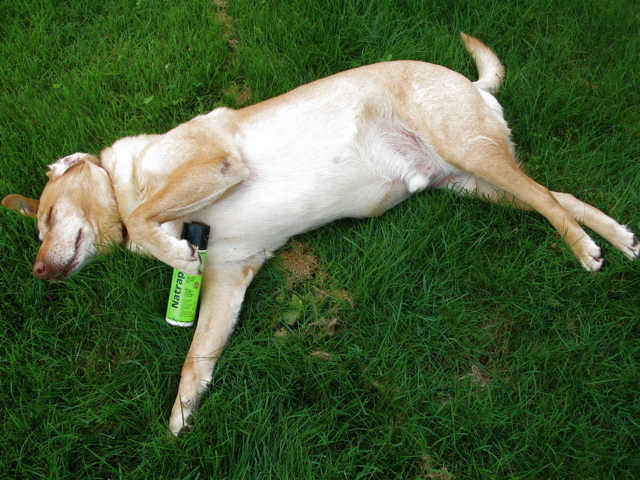 Be sure to allow some slack to spare before cutting. Once you have completed the dry run, lay out and cut the plastic and set the edge of one long-side, (8′ side), of the hoop house toward the end of the plastic with the remainder of the plastic trailing away from the structure. Be sure to leave a few inches to fold up under the wood frame. It is easier if one person holds the plastic in place while the other staples. 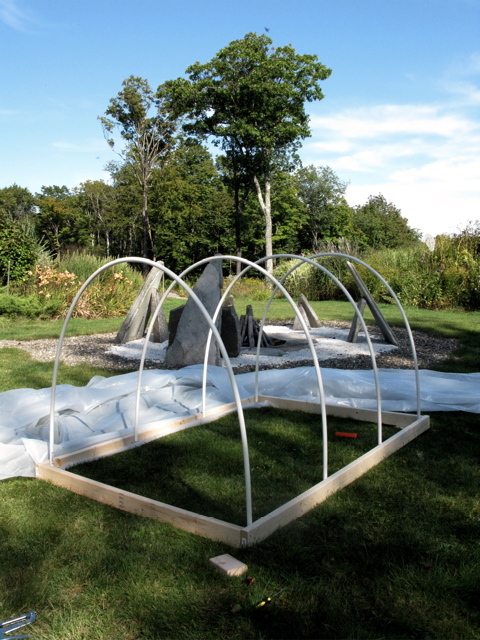 Once the first side is secure, pull the plastic up and over the hoop house from the outside, and bring it around, lifting the other edge and setting down, once again with a few inches to spare for folding. This time you will be working from inside the enclosed hoop-house, so it may be helpful for the second person to hold up the finished end slightly for ease of stapling the other side. (Optional: For extra durability, it is useful to add strapping to cover the stapled plastic edge. To do this, cut a 3 1/2′ piece of strapping and lay it over the stapled plastic edge, and screw it in place with 2″ coated screws. This will help protect the plastic edge from tearing at the staple points). If you have installed a plywood back with vent, at this point you will need to tightly fold or roll the extra plastic at the end and staple it to the plywood exterior. 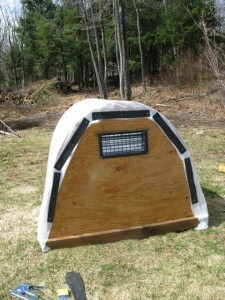 You can protect the edges with strapping, (wood, or recycled plastic as shown in the photos above). 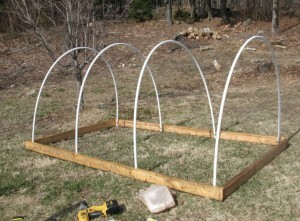 The hoop house cold frame is ready to install! Though Oli is invariably involved in these projects, he can not be counted as a helper. You are currently browsing entries tagged with cold frame at The Gardener's Eden.